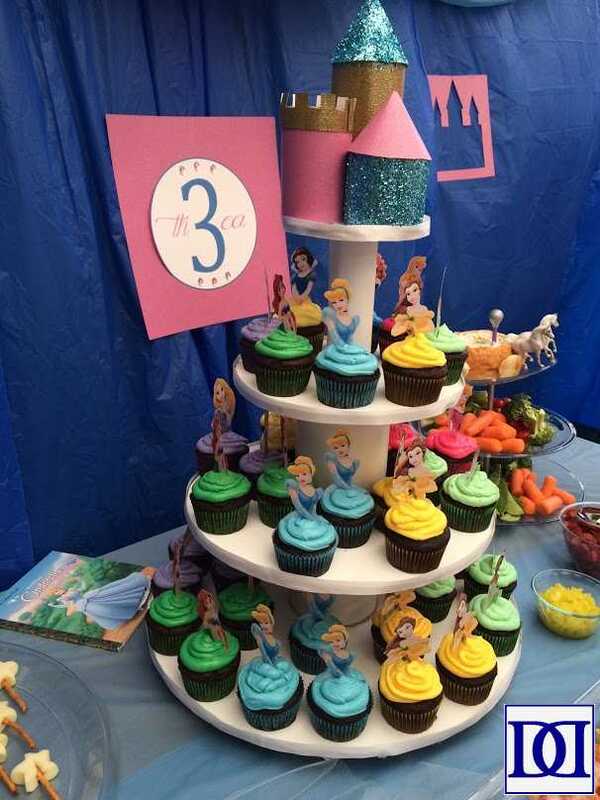 Princesses, Castles, and Cupcakes, OH MY! 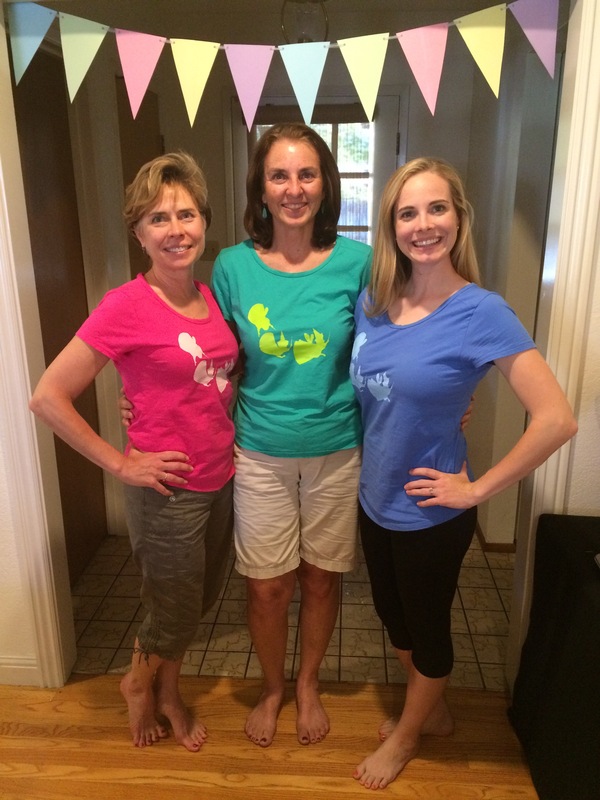 As a tomboy mom, raising a princess-obsessed daughter is a challenge. 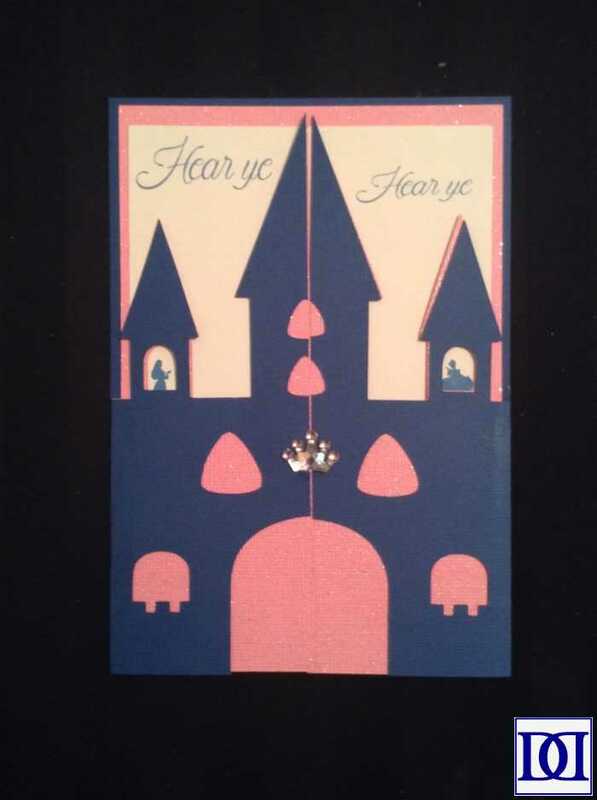 That being said, we are exploring ways of enjoying this stage together, and planning/executing a princess-themed third birthday is definitely one of them! Since she didn’t really want to settle on just one princess, I had a fun time picking and choosing bits and pieces of the entire Disney princess genre. 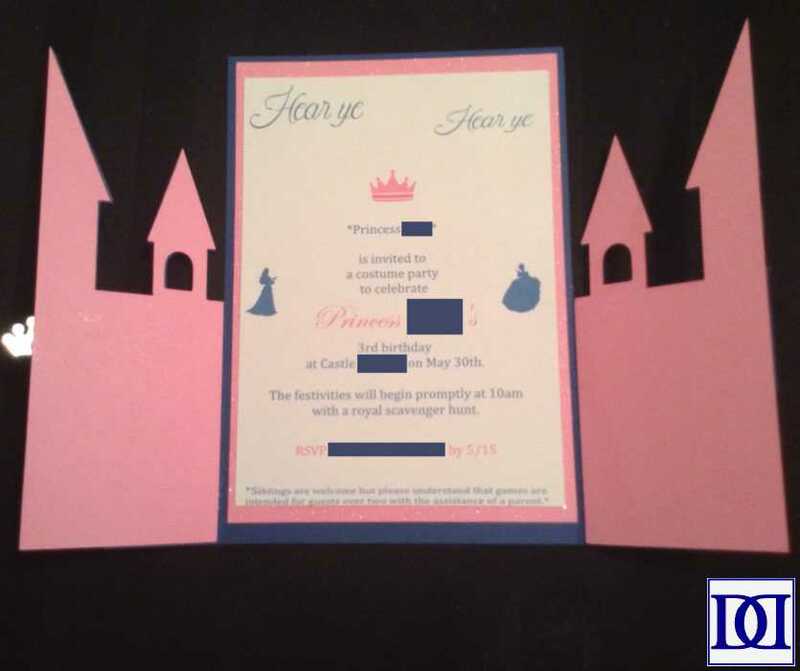 All are invited to join our magical adventure in planning, preparing, and executing a party fit for any princess! Whether you find ideas for your tiara-clad progeny’s next bash, your next trip to Disney, or anything else, I hope you stick around for a while! I plan to add tutorials as I can, so if you’re curious about a particular item, I’ll be sure to prioritize. Otherwise, please check back soon for tips and tricks to accomplishing these crafts, treats, and more! This year was a more challenging year than the previous two. First, our birthday girl was in a big “project” phase where free play was more stressful for her than organized activities. Second, the majority of our friends had a second child (newborn-18 months) who probably wouldn’t be able to participate as easily in an organized activity. That being said, we catered our party to preschool-aged guests and did our best to warn parents of this reality. 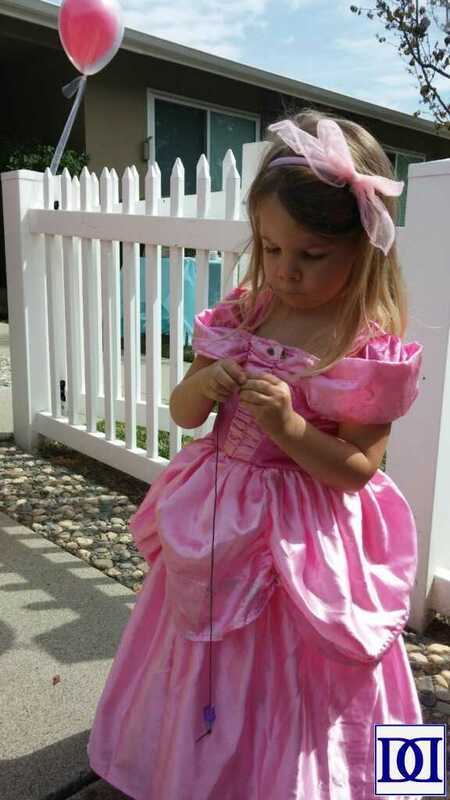 While my three-year old may love being a princess, she is also a three-year old and an active one at that. As a result, many of the princess dresses we found for her were either too “scratchy” or unable to survive her level of play (or my budget). 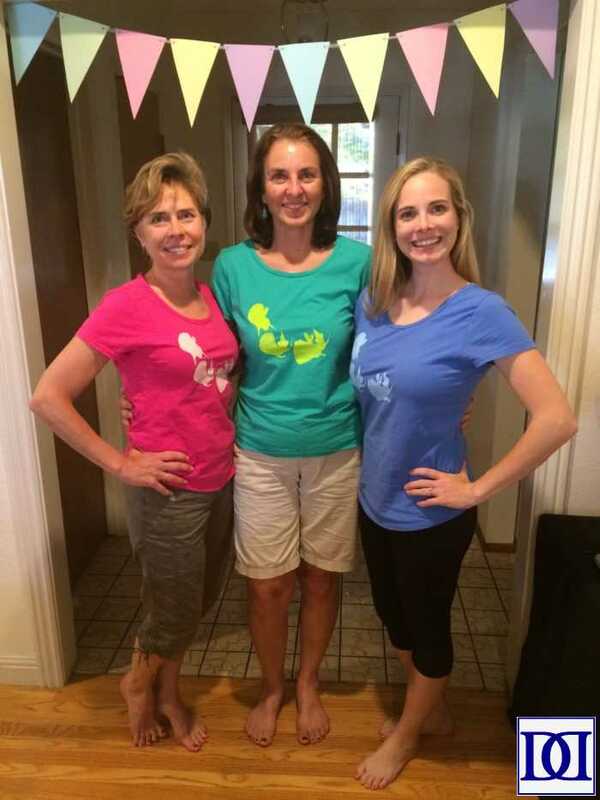 My sister-in-law found this awesome company that makes sturdy dress-up clothes that resemble the Disney princesses and are reasonably priced. We were hooked!!! When hosting a larger party, especially when you may have guests who don’t know all of the members of your family, I think it’s fun to dress the hosting adults up en-theme as well! We were fortunate enough to have not only Jenna’s parents but also three of her four grandparents in attendance as well!!! For the gentlemen, I made tshirts for the two princes that Jenna liked best (Cinderella’s Prince Charming and Aurora’s Prince Philip). Since there were three hosting women, I thought it would be fun to dress us like the three good fairies from Sleeping Beauty. Since we would be helping to coral dozens of children under 3, I also wanted this “costume” to be as functional as possible! 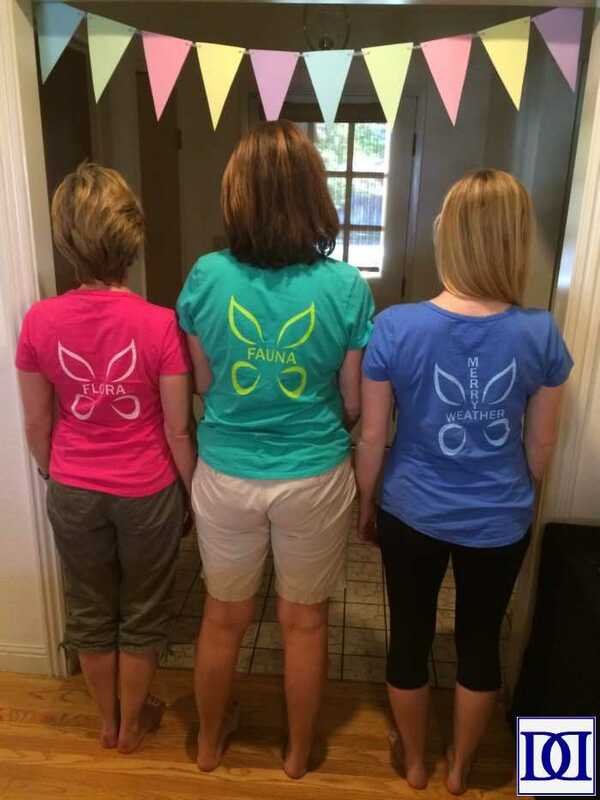 Thank goodness for the ease and in-expense of screened tshirts!!! 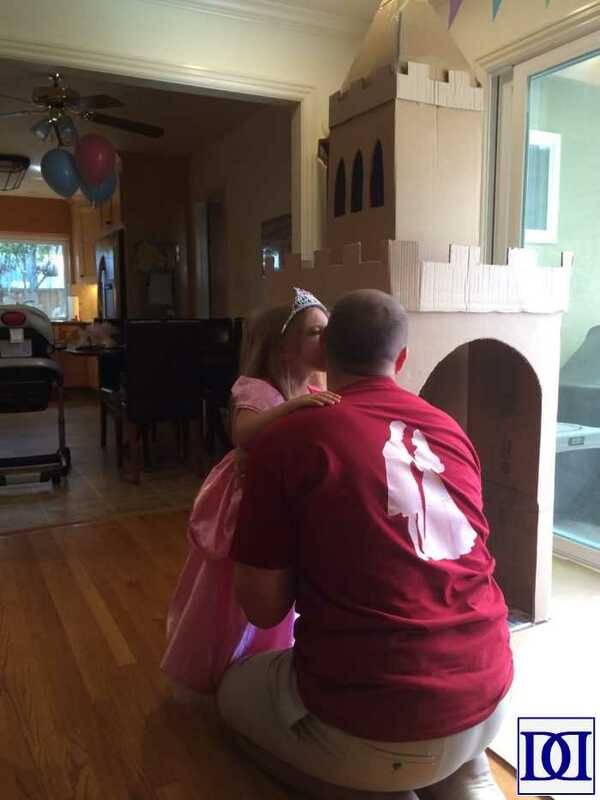 One of the main requests from the birthday girl was that there be a castle where she and her friends could play. 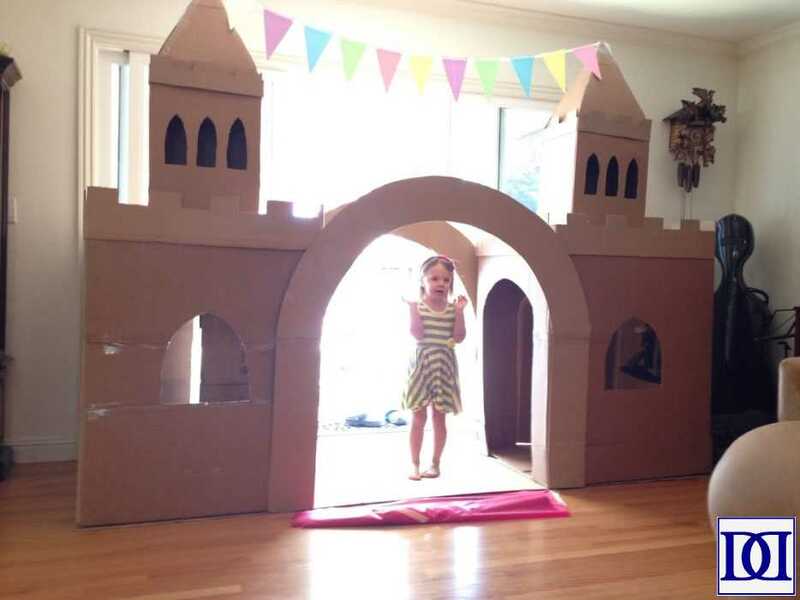 While I wasn’t willing to buy anything expansive, I was able to make use of some perfectly-sized cardboard to make a pseudo-preschool sized castle! 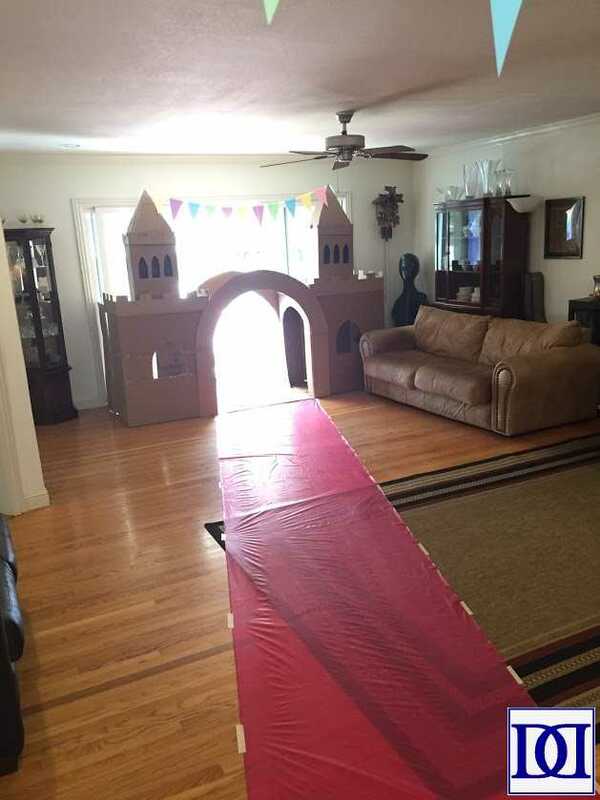 Over the course of the weekend, we were able to design and create this awesome two-towered cardboard castle for our princess and her guests. As a side note, the garland we hung on the top of the castle was repeated throughout our house and backyard. Thanks to a phenomenal sale at our local craft store, we were able to hang these paper triangles with tulle ribbon instead of yarn or some other, less-princesss-y string. 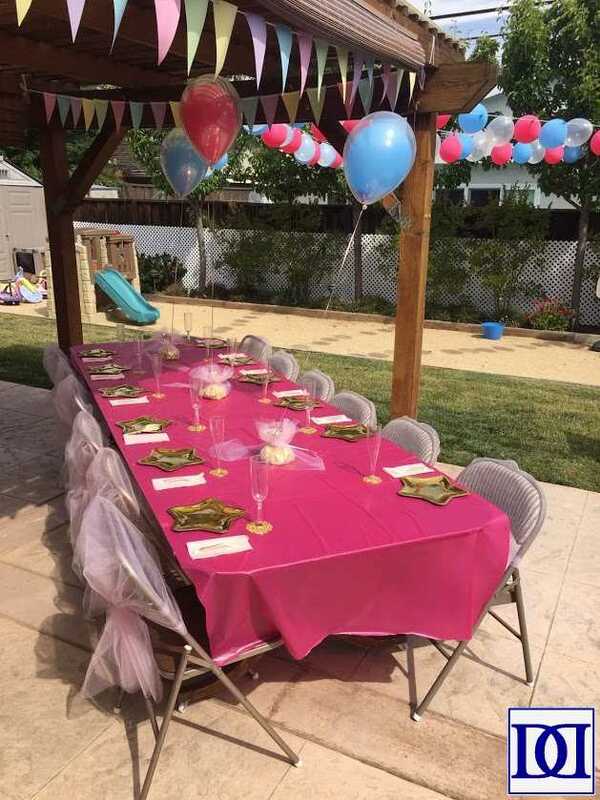 We were also able to find this roll of pink tablecloth to give our princes and princesses a royal entrance. At the time of the party, our two kids (3 and 6 months) were OBSESSED with balloons! As a result, we used them extensively for the party. My favorite way to “dress up” balloons is to use two at once! 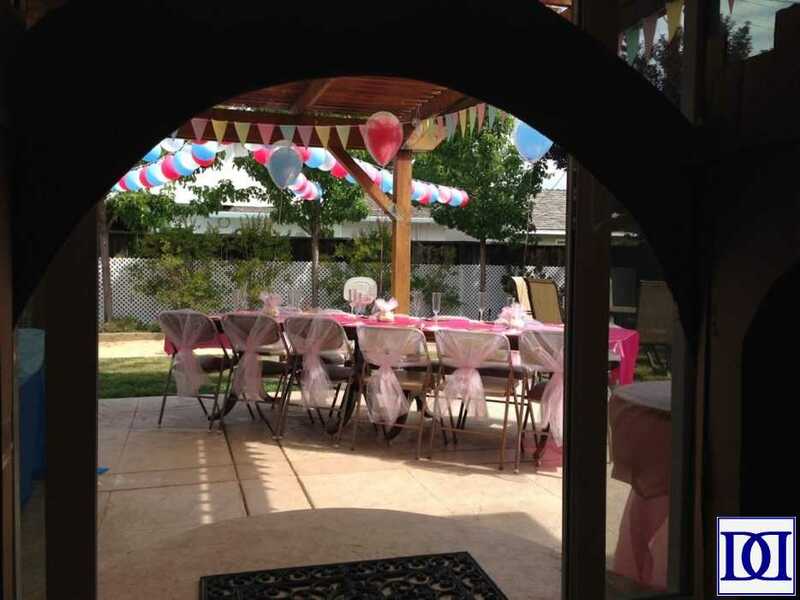 We used these double balloons all over the place, and hung them with tulle ribbon. 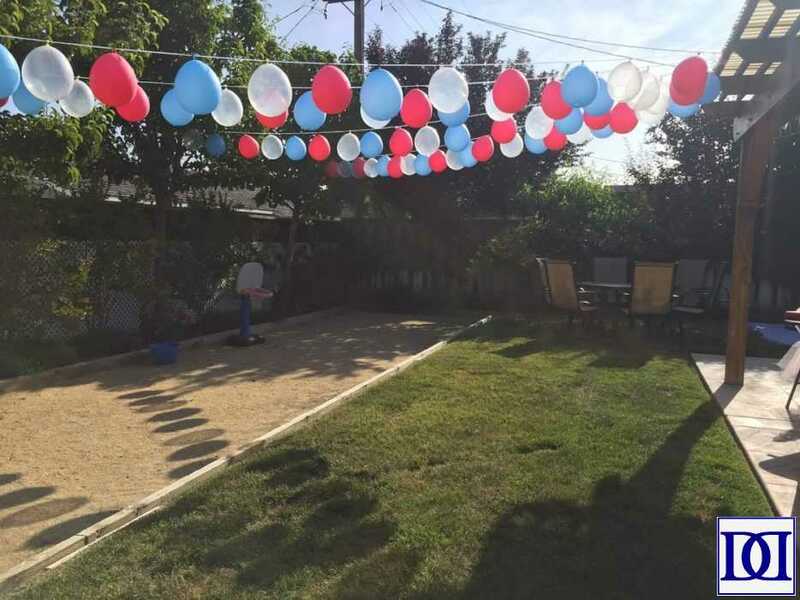 Speaking of balloons, these balloon garlands made for a festive addition to our backyard! I found an entire bolt of pink tulle at a consignment store and went to town wrapping it around chairs (secured with sequined ribbon) and gathered over doors in our house. 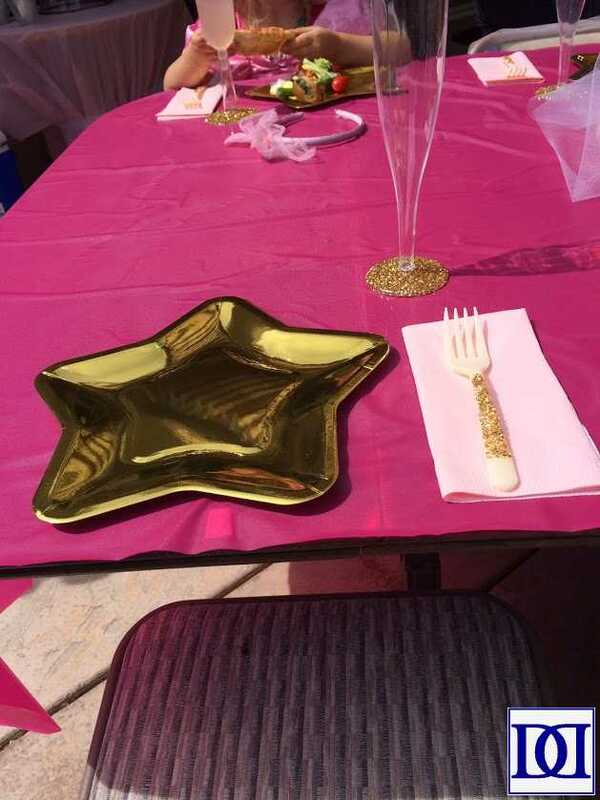 Jenna really wanted the main colors to be pink and gold, and she was very partial to “sparkles.” We dressed up disposable place settings and made these glittery champagne flutes and plastic forks for our 3-and-up guests. We had non-glittery items for our adult/toddler/baby guests. 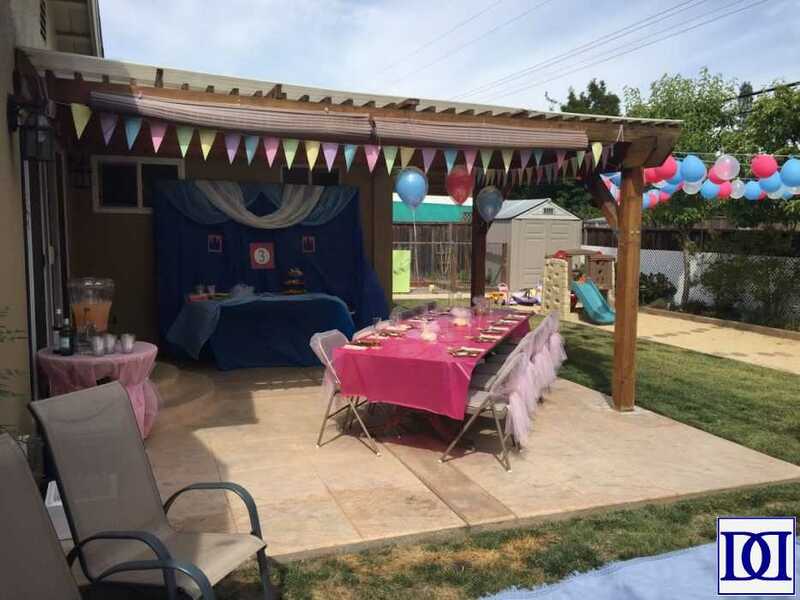 Since we wanted to expand the color palate of the party a bit, Jenna and I settled on a Cinderella backdrop, and we managed with swaths of plastic tablecloths. Overall, it was a fun effect, and it gave the food a fun setting of its own! Jenna had great ideas about food as well! 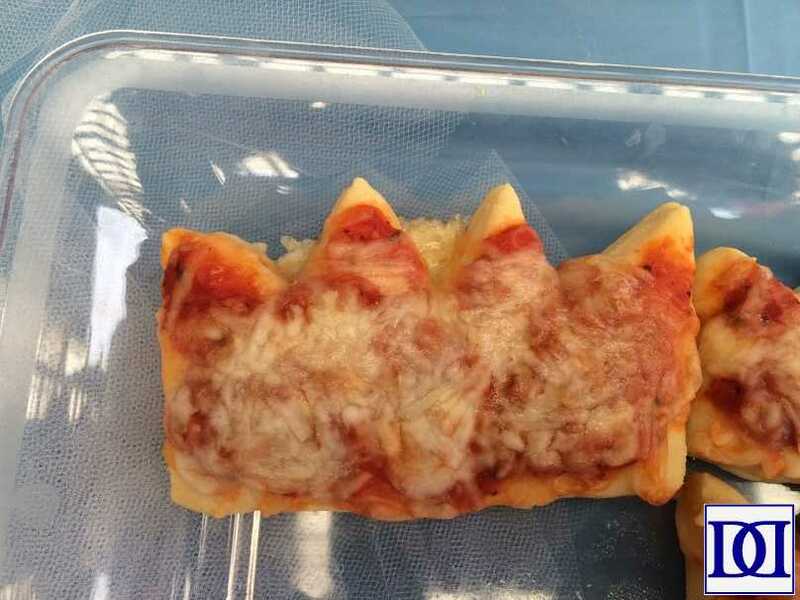 She asked for pizza as a main dish but specified that she would prefer “princess” pizza to regular pizza. After some digging, I learned that this request had nothing to do with toppings but instead with shape (three-year old prerogative). 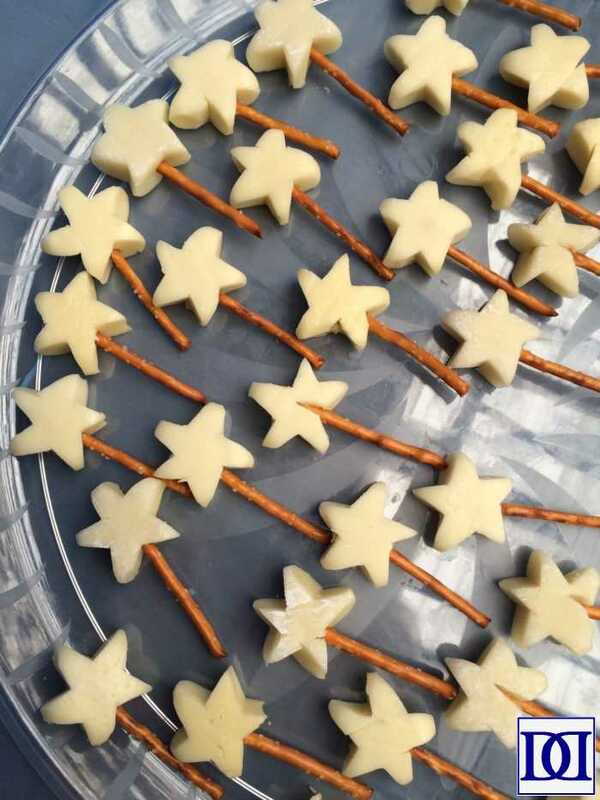 After developing this recipe and acquiring several different toppings options, I felt that we could honor her request and still feed our guests of all ages and stages. As a mom who does not have picky eaters (*yet*), I try to get vegetables on the table for virtually every meal. With this awesome platter, finding new ways of displaying a veggie tray is a real joy! 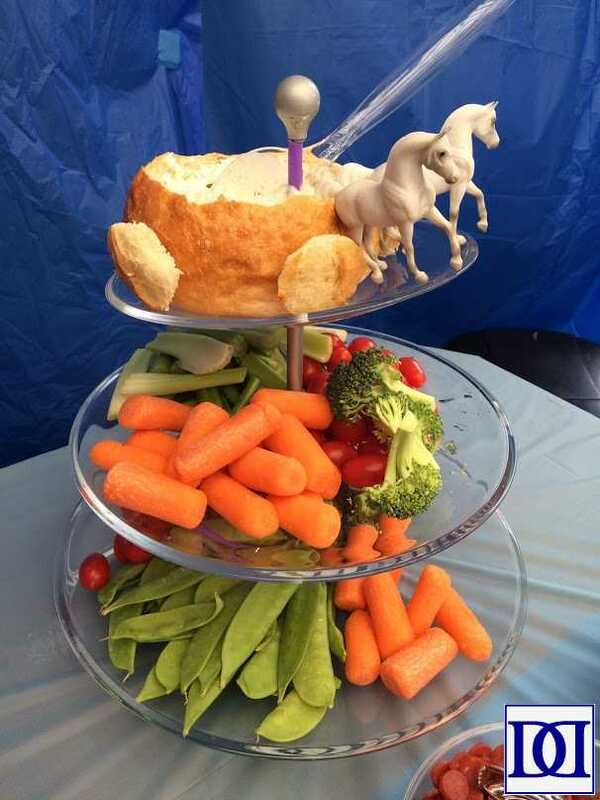 The “carriage” of veggie dip is a cut and cored bread bowl (top pieces re-imagined as “wheels”) along with two Dollar Tree plastic horses. 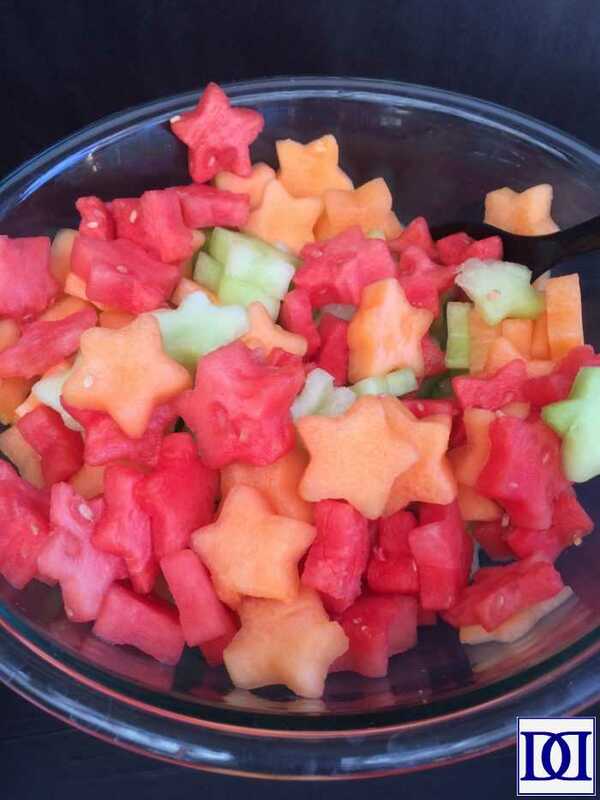 Once we started with stars, Jenna loved playing with cookie cutters, so we went ahead and used the same cutouts for our fruit bowl as well! Understandably, the very first discussion we had about her birthday party revolved around dessert! 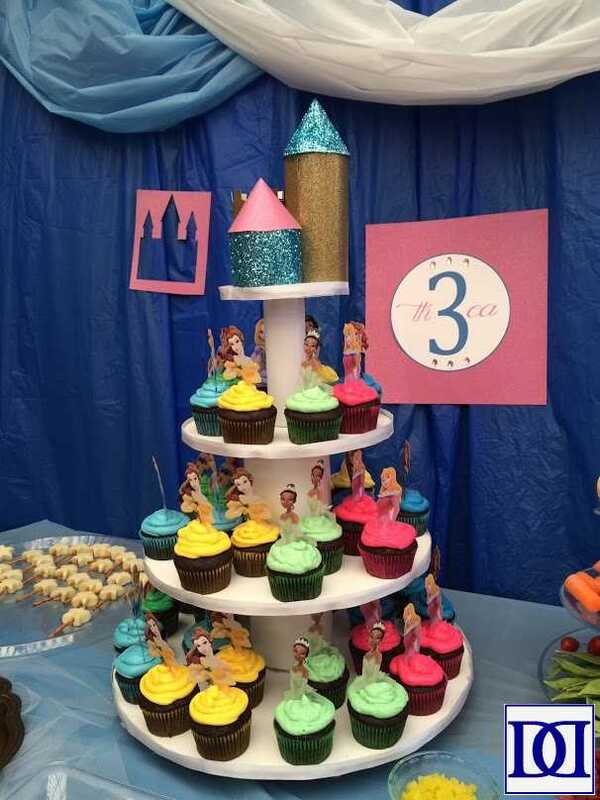 Jenna had very specific ideas about what constituted “princess cupcakes,” and I thoroughly enjoyed indulging her imagination when creating these treats for her and our guests! 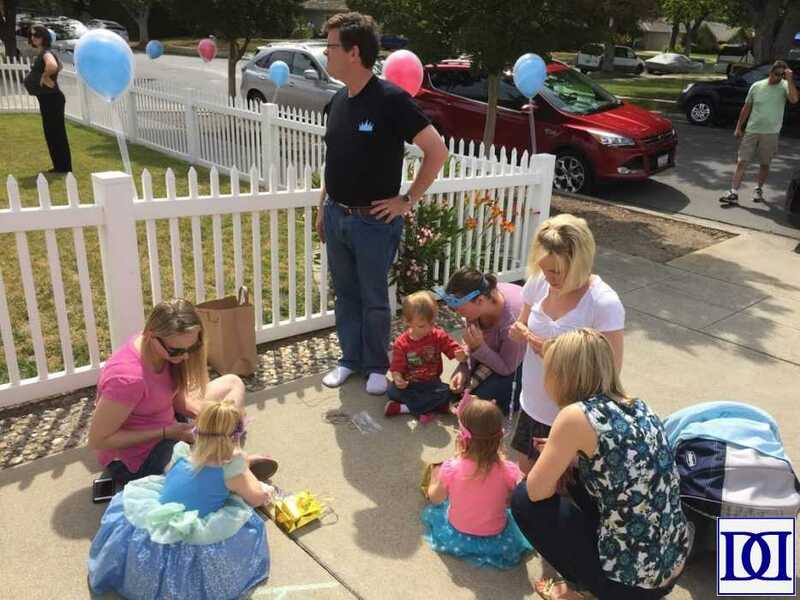 We wanted to wait and start the crafts after a majority of the guests had arrived, but we also knew that we didn’t want bored and fractious kids in the process. 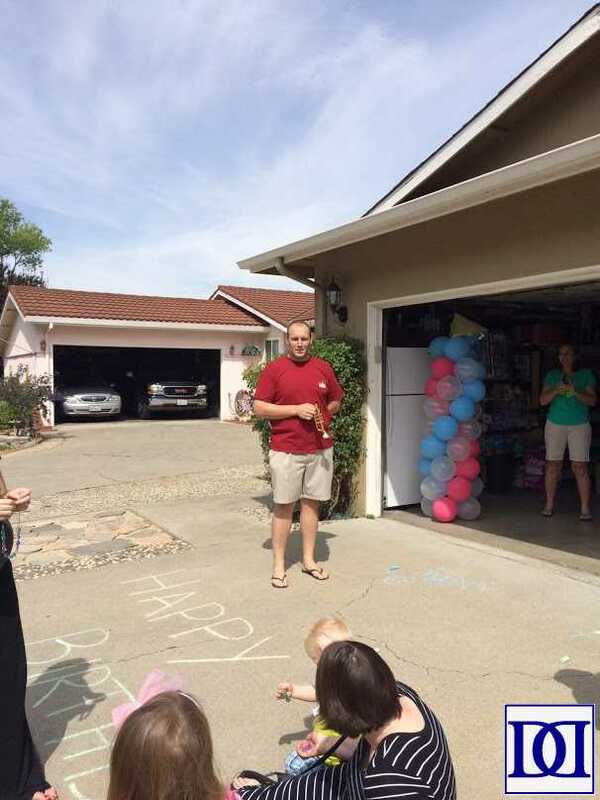 While kiddos were waiting for the fun to begin, we set out sidewalk chalk and let everyone go crazy with designing our driveway. When it was time for the fun to begin, John called everyone’s attention to our first task (we bought him a plastic trumpet to complete his role as “herald”). 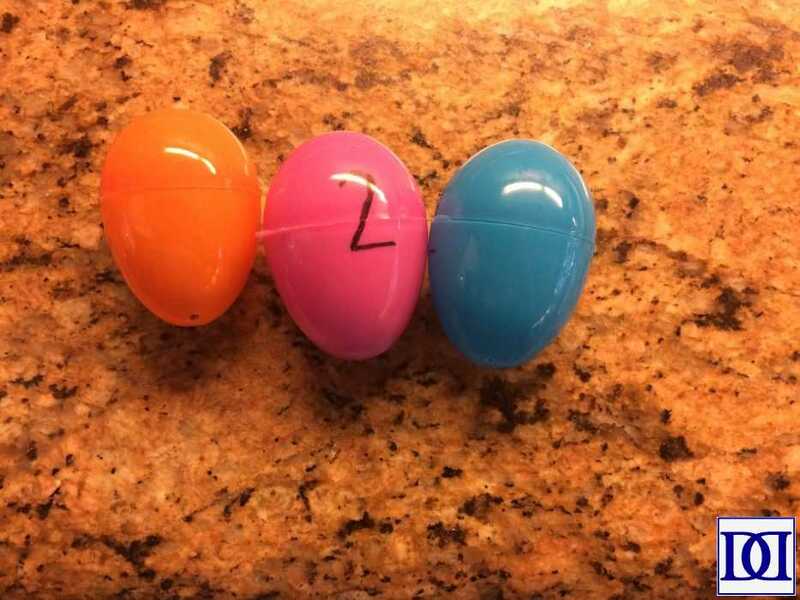 Having several leftover eggs from Easter, I was able to use three categories of eggs: pink, orange, and blue. Jenna helped me fill each category of egg with the smaller materials from one craft (pink=tiara, blue=necklace, orange=toy). Then, we numbered the eggs so that there were an even number of 1’s, 2’s, and 3’s. 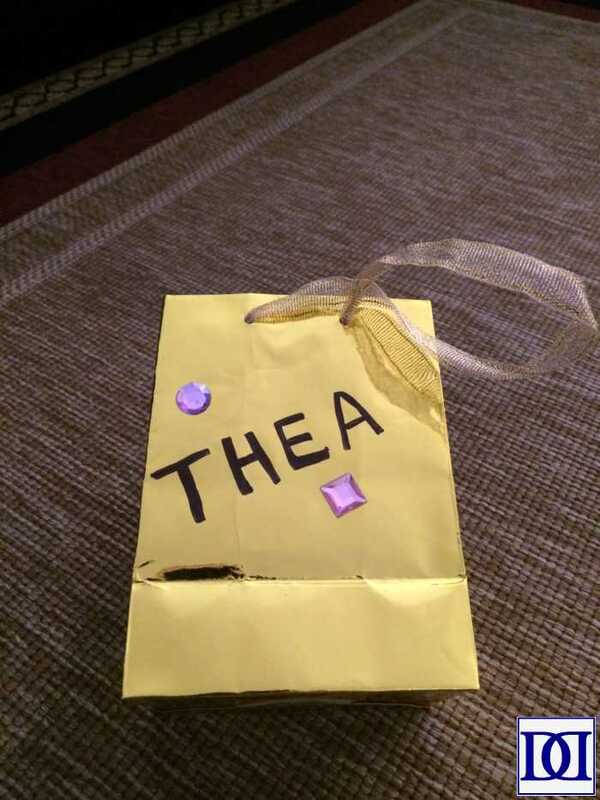 Since it’s nearly impossible to have an egg hunt without a bag, we acquired these gold bags from the Dollar Store, decorated them with gem stickers, and labeled them with people’s names. Once we had everyone’s attention, we set the kids loose to find their bag and fill it with one egg of each color (and to remember to have a 1, 2, and 3! 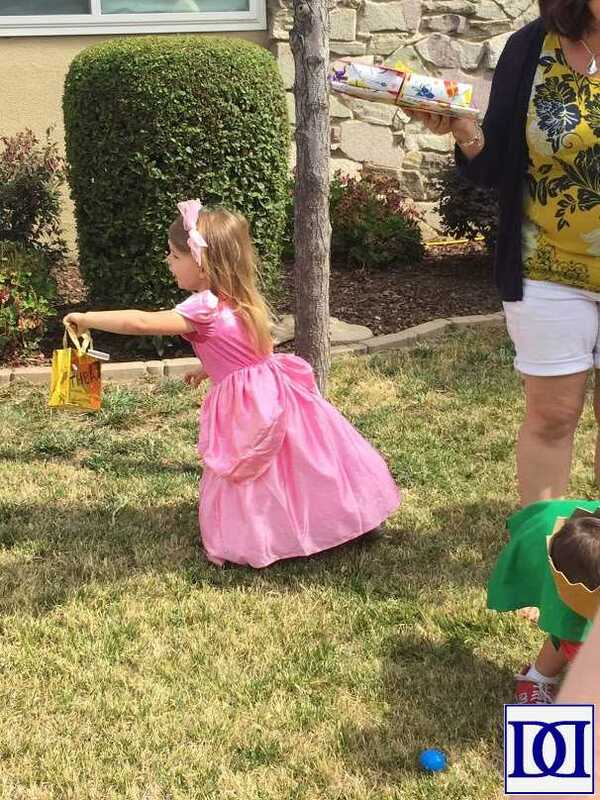 The pink eggs contained an equal assortment of gem stickers for the kids to decorate crowns or tiaras. The station had the crowns/tiaras waiting for the kids to choose which one they wanted to decorate. Incidentally, I loved this packet of tiaras because they are foam, adjustable, and include an assortment of shapes and colors. This station was the least time-consuming, so I suggested to our station-manager (Jenna’s grandmother) that she direct kiddos back to the chalk if they were getting bored. All in all, the kids enjoyed continuing to decorate their tiaras until it was time to head to the next station, and they turned out beautifully! The blue egg contained an elastic string that I had previous cut (I also coated the ends in fray check and tied a knot on one end to make them easier for kids to bead). At the station itself, I had individual snack bags of an equal assortment of gem beads (I bought mine at JoAnn’s but can’t find them anymore). In order to get an idea of timing, I had Jenna complete each project in the weeks leading up to her birthday. This project took the longest by far. 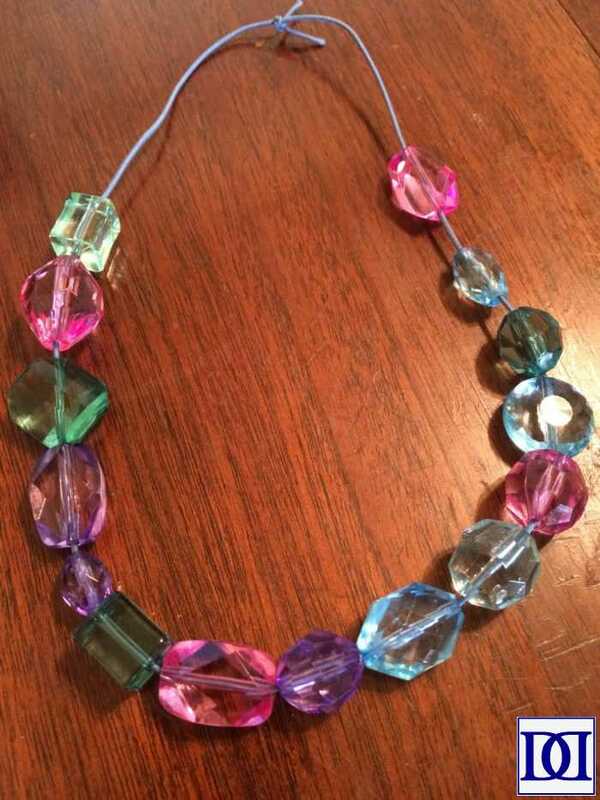 As a result, I was very happy we had individually packaged the beads in a way that kids could complete their necklaces in their own time. 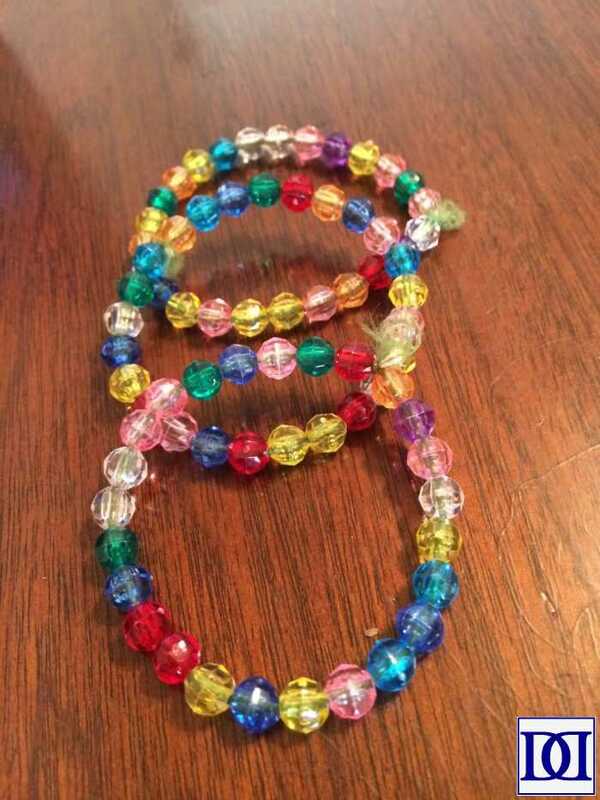 For a children’s beading project, I thought they turned out very regal looking! 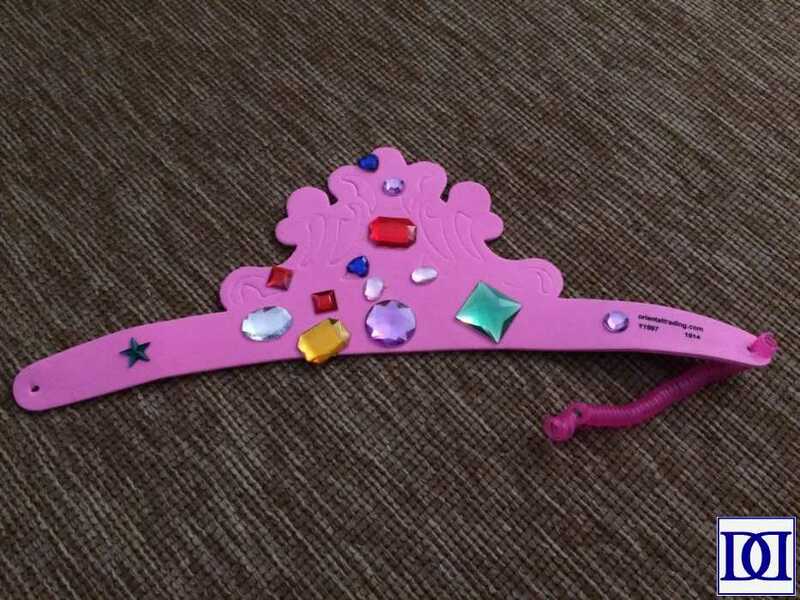 Coming up with a final craft to make a “princess toy” was not easy! After significant research and a lot of help from my resident princess, we came up with this Disney princess I-Spy bottle. 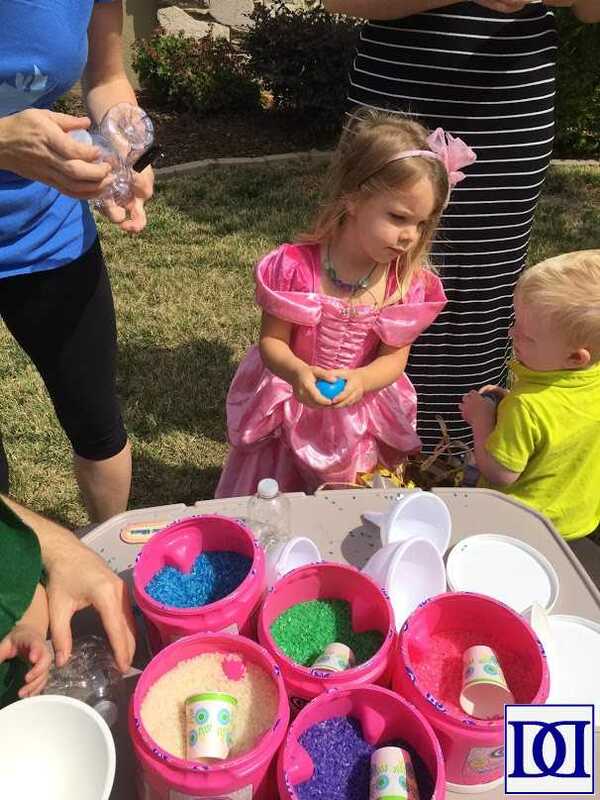 The orange egg contained the small printed cardstock pieces, and the station involved scooping colored rice into mini-plastic water bottles with various measuring spoons and funnels. We also had a variety of foam stickers and a sharpie for kids and parents to personalize the bottle caps. 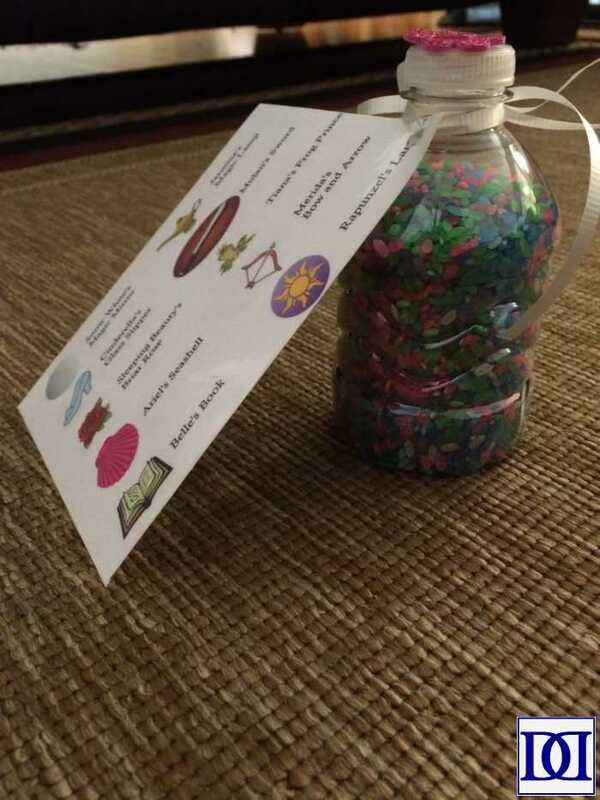 Once the kids were done with their bottle, I hot-glued the cap to the top and attached a “cheat sheet” of the various pieces. Jenna continues to use hers as a simple quiet time activity! After the crafts, we set everyone loose to enjoy food, the backyard, and the castle. A group of kids even started their own impromptu dance party! 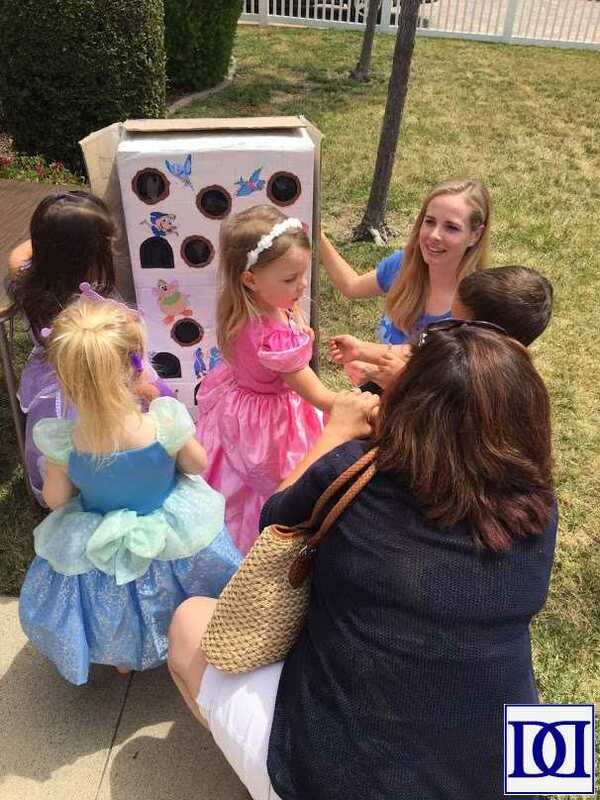 When it was time to leave, we had kiddos grab one last “happy” (an elastic beaded bracelet that Jenna made) from this Cinderella punch box. 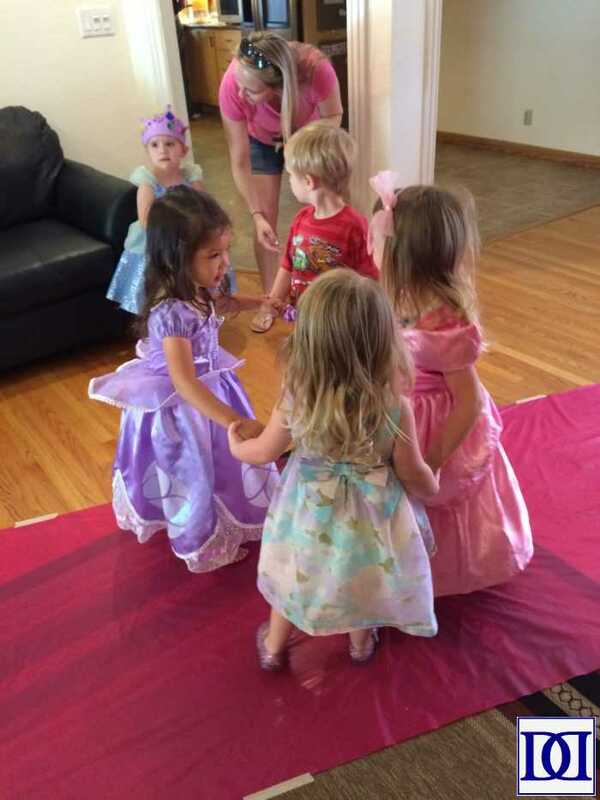 It was a fun way to end the day, and left our guests with one last article to complete their royal ensemble (and it gave Jenna something to do while I was otherwise occupied in the weeks leading up to her party). 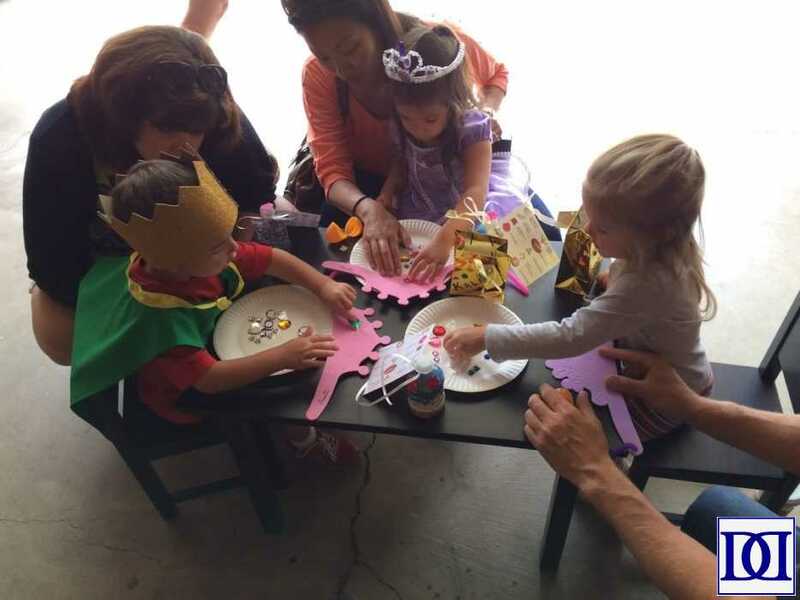 Whether you’re throwing your own princess-themed party or are looking for ways to entertain your royal-minded tykes, I hope you find some ideas here to help! 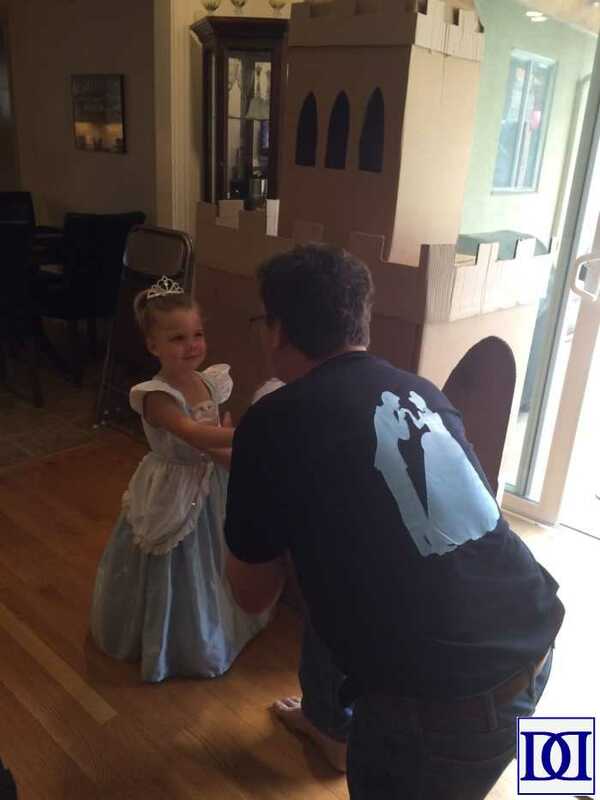 2 Responses to Princesses, Castles, and Cupcakes, OH MY! So creative! And lots of fun! !